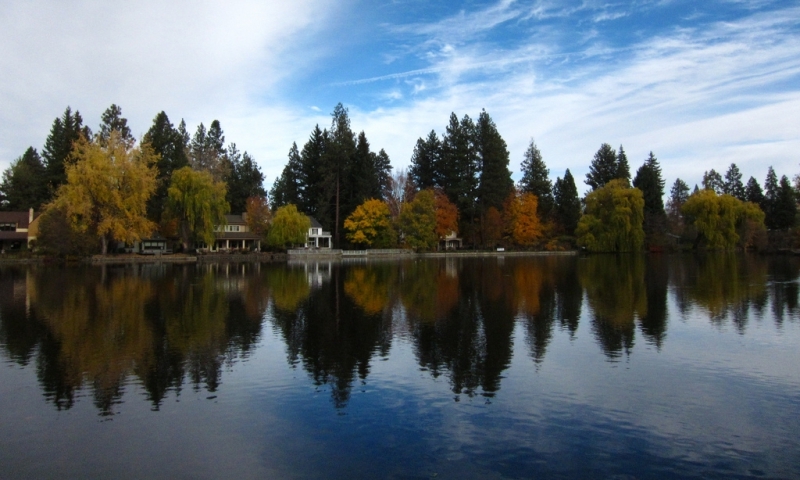 One of Bend’s most scenic spots, Mirror Pond can be found downtown near Drake Park on the beautiful Deschutes River. Located in beautiful downtown Bend near several shops and galleries. Drake Park is a popular location for events. Ducks, geese and swans can be seen in Mirror Pond. The pond is located on the 250 mile long Deschutes River, which flows through Bend. Mirror Pond is a popular spot for locals and visitors to enjoy in Bend’s beautiful downtown area. Located on the Deschutes River, the small lake’s sparkling waters attract a variety of waterfowl including Canadian geese and ducks. A pair of graceful swans from England can be seen floating in Mirror Pond. A variety of events are hosted at nearby Drake Park. Several boutiques, galleries, restaurants, and other interesting shops are located within walking distance of this picturesque pond. Mirror Pond, Bend, Oregon is located in downtown Bend, just off NW Newport Avenue. It is part of the Deschutes River, which flows through the city. Bend City Hall, 710 NW Wall Street, Bend, Oregon, 97701. Phone: 541-388-5505. Shops, Galleries, etc – While you’re visiting Mirror Pond, be sure to take some time to explore the many boutiques, specialty shops, and galleries that just a short stroll away. Drake Park – This beautiful park near the pond is a popular location for events. It also has interpretive trails to enjoy as you stroll by Mirror Pond. The two swans at Mirror Pond are originally from England. They come from Queen Elizabeth’s royal swannery. Mirror Pond is located on the Deschutes River, a 250 mile long river that flows through central Oregon. It is known for fabulous whitewater rafting and excellent fly fishing. Connect with travelers planning a visit to Bend Oregon.